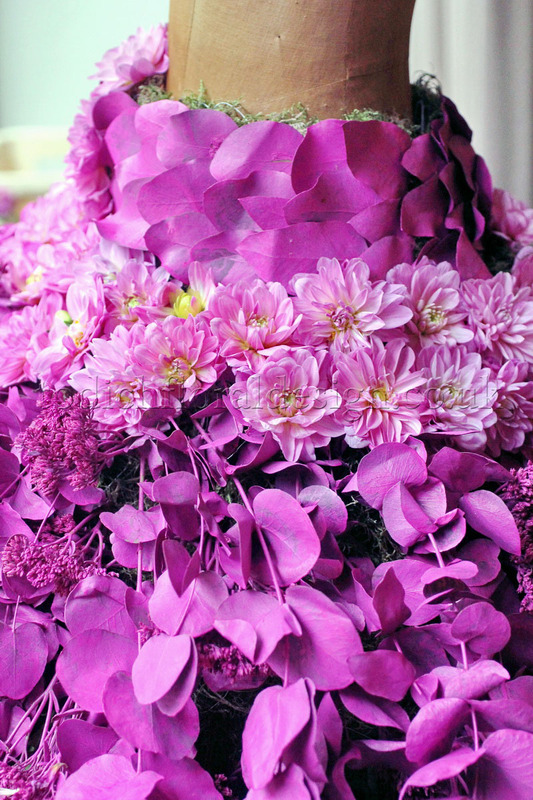 It is not every day that our florists get the opportunity to design a unique floral creation for a prestigious fashion event, but this September our team put their creative minds together to work towards a dazzling flower display which was set to amaze the London general public. 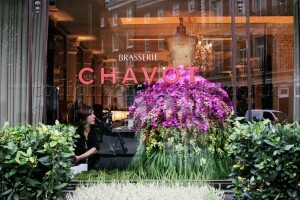 Todich Floral Design regularly provides stunning window displays for Michelin star restaurant ‘Brassiere Chavot’. 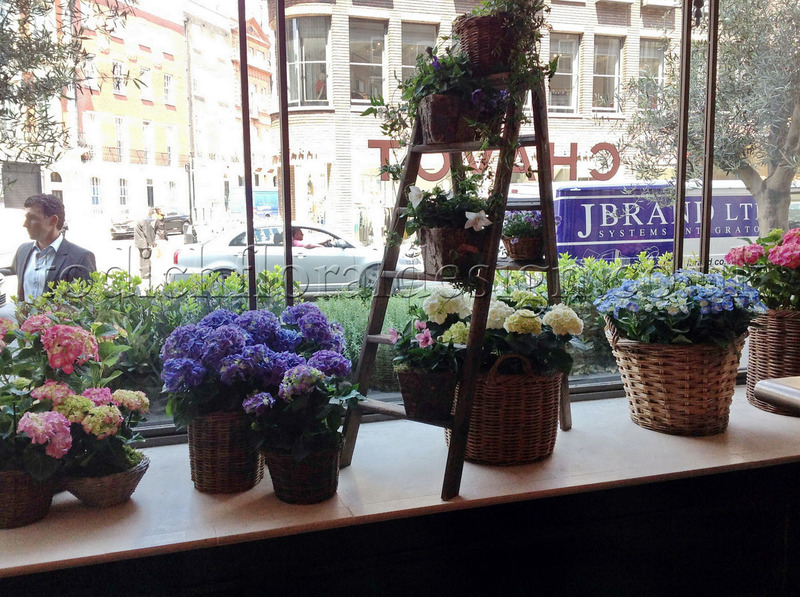 Based in central London, the brassiere is fronted with a large glass window which is filled with flowers, plants and herbs to capture the attention of passers-by. Head consultant Laura Fisher works with the owner in creating flower displays that will enhance his restaurants décor and designer brand. Our floral window exhibits are always designed with seasonality in mind. With using the freshest available plants and flowers our displays contain an abundance of colours with a variety of different aromas. 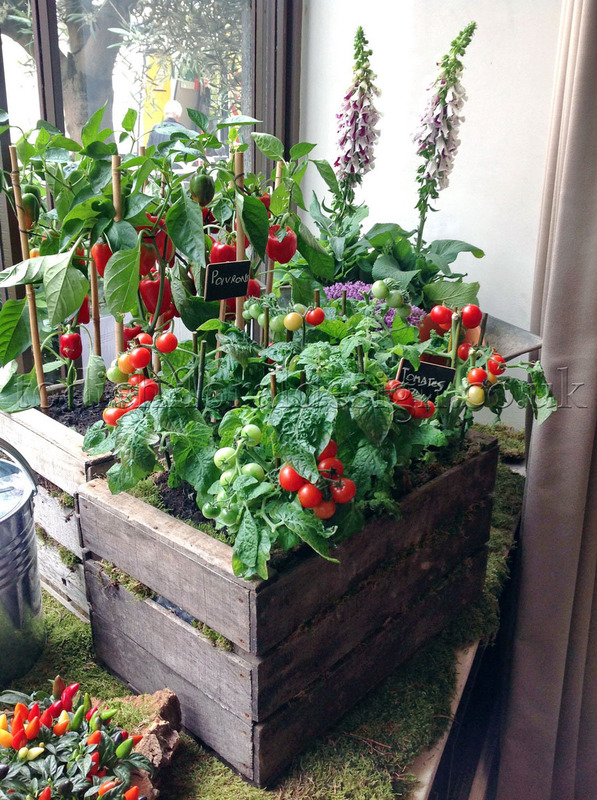 We design window displays like no other London florist; as well as using flowers, herbs and plants we add second hand furnishings and materials to add that extra little wow factor. From pre-war suitcases, rustic crates, to wooden garden benches, our floristry team put a lot of thought into every monthly design. London fashion week: London Fashion week is a prestigious clothing event that is held in central London for one week during the spring and autumn seasons. Our head designer felt so inspired by the London event that she wanted to incorporate fashion with flowers into the September display. After approaching the owner with her fashion idea, Mr Chavot couldn’t wait for the window styling to begin. 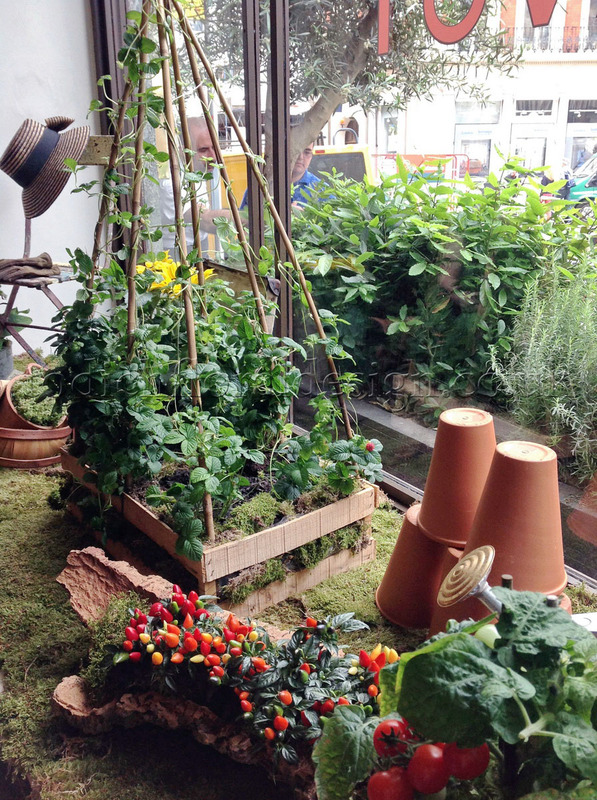 Our floristry team created floral mood boards, studied clothing trends and researched ideas for the window display. Laura Fisher luckily was able to source a French antique mannequin which was to stand centre stage of the exhibit. The French mannequin oozed chic and was loved by the Todich Floral Design team. A mesh frame was structured around the figurine and English moss was woven around the wire. The wire mesh formed a knee length 50’s style dress which would be decorated with flowers on the first day of fashion week. The team organised an event around the ‘unveiling’ of the floral dress. Photographers, writers and publicists gathered around the window whilst the florists dressed the mannequin with a variety of fresh flowers and foliage. The florists Kalina and Nele started with weaving thlaspi (green bells) to the base of the design, the next layer included green amaranthus flowers which was then followed with bright yellow achillea. The diners in the restaurant watched in awe as the flower dress progressed in the window. With the help of fashion student Jake Gooden and managing director Todd Z.Todic, the event was a success. The florists then started to add vivid colour to the design with the use of pink antirrhinum and yellow antirrhinum flowers for a more eye-catching display. The next step included sprayed pink eucalyptus leaves and vivid pink sedum flowers which were placed next to hot pink dahlias. The florists then created a belt around the waist which was made of up eucalyptus leaves and finished the design with tropical red gloriosa flowers. The flower skirt was mesmerizingly beautiful and had splashes of colour throughout. The colours and style were both inspired by the new 2014 spring collection. The mannequin was placed on a carpet of English moss and was surrounded by rustic wooden crates and a vintage frame. Todich Floral Design teamed up with London jewellers Tateossian, who provided a dazzling necklace which sat on the neck of the mannequin. The window display proved to be an overall success for everyone involved. 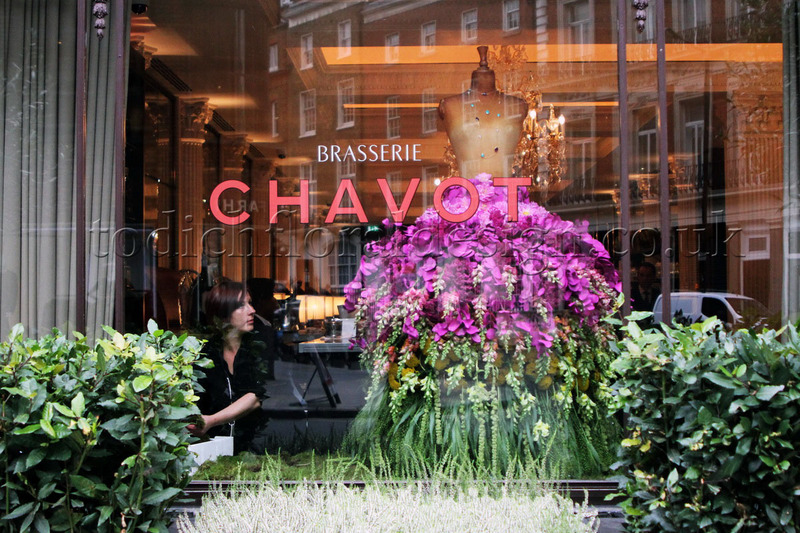 Passers-by stopped in awe, and the owner of Brassiere Chavot marvelled in wonderment. We hope next month’s display will be just as beautiful and popular as the last. Todich Floral Design is a London florist who specialises in wedding, event and corporate floristry. 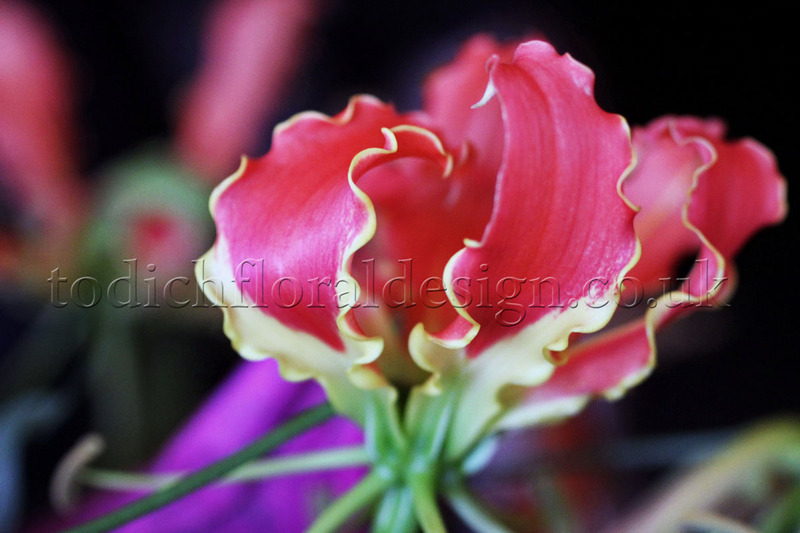 Established in 2001; the company has a brimming portfolio of dazzling floral displays which have been designed for prestigious wedding and events. Todich Floral Design sources all their fresh flowers from the UK and offers a free consultation service with all new clients. If you wish to contact us for a quotation of bespoke flower displays, then email us on eves@todichfloraldesign.co.uk or telephone 020773771166. 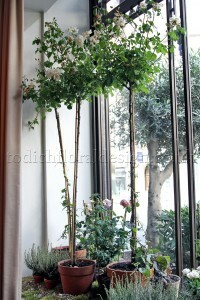 So for our next installation at the French Brasserie we, as usual! had so many ideas and we really wanted this one to shout ‘summer’! We wanted to create a fresh and relaxing feel – and what with the hot weather and busy location of Mayfair, we thought that what the Brasserie really needed was some tranquillity. 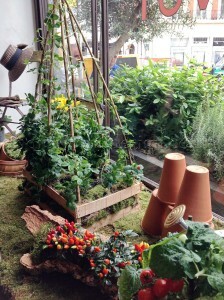 The team discussed lots of interesting and diverse ideas, which always starts with a brainstorm and looking at lots of lovely images; we eventually decided to install a Cottage Kitchen Garden in the window! Gardens can incorporate such a variety of flowers, fruit, and vegetables that we really needed to research which would work best in the window so as to narrow our selection down and give the desired effect. For the vegetables we chose beautiful vine tomatoes, capsicum peppers, and red chilli plants. The team had been out collecting lots of quirky items to display the plants in which resulted in the chillies being planted in large logs which had been carved out – the effect was stunning with the vibrant colours of the chillies really popping against the dark wood -, and the tomatoes and peppers in French wooden crates – which are a great idea for your own gardens; if you are short on space have a go! 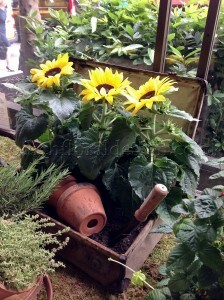 The central focus of the window display were wild strawberries, which we grew up garden canes in the preceding weeks, and again planted in a shallow crate; and another interesting prop that we found was a very old children’s wheelbarrow which we filled with stunning foxgloves – which are perfect for a pretty summery vibe with their striking white heads decorated with little spots of purple – and herbs; we wanted to create the effect of them just having been thrown into the basket! An old French chair was placed at one end of the design with a sunhat placed jauntily atop , and a wooden trug filled with gardening gloves and pots at the other – carrying on the idea that the garden was very much in use! Our final idea was to create the effect of a real lawn in the window, so we mossed the entire window sill, which was the finishing touch to our beautiful Cottage Kitchen Garden! The designers who work on the London French brassiere have been very focused on using lush greens which have included lots of seasonal herbs and other lovely plants for the last three designs. The design team felt this time they needed ‘colour’, to fit with the lovely warm weather that England is having at the moment. Finger’s crossed it lasts! 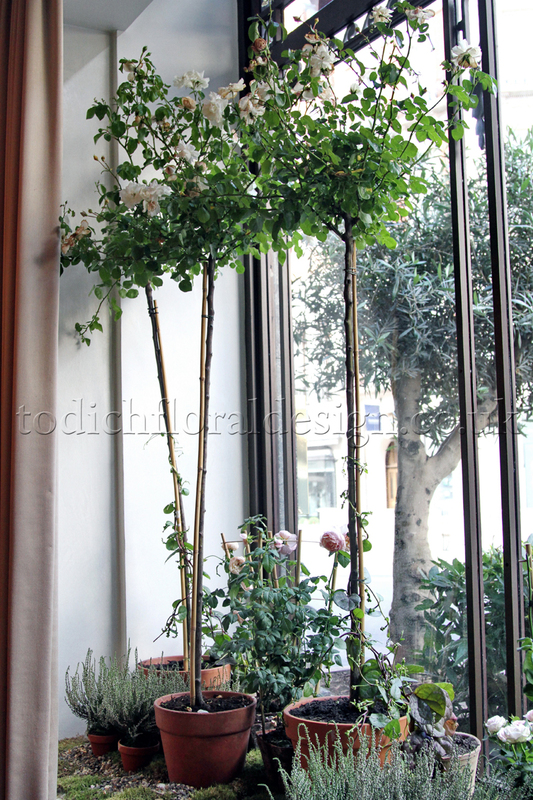 We looked at different options and we always like to include some height in the window so you get both impact from inside and create interest from outside of the restaurant. There were many options and different designs discussed within the team but we finally decided to look for an old ladder which would fit with the rustic theme. We have a wide range of props which we hire out for wedding and events and we feel it is really important, to use interesting items alongside the flower designs. The team worked on a range of ideas and finally decided on ‘Ladders and Baskets’. 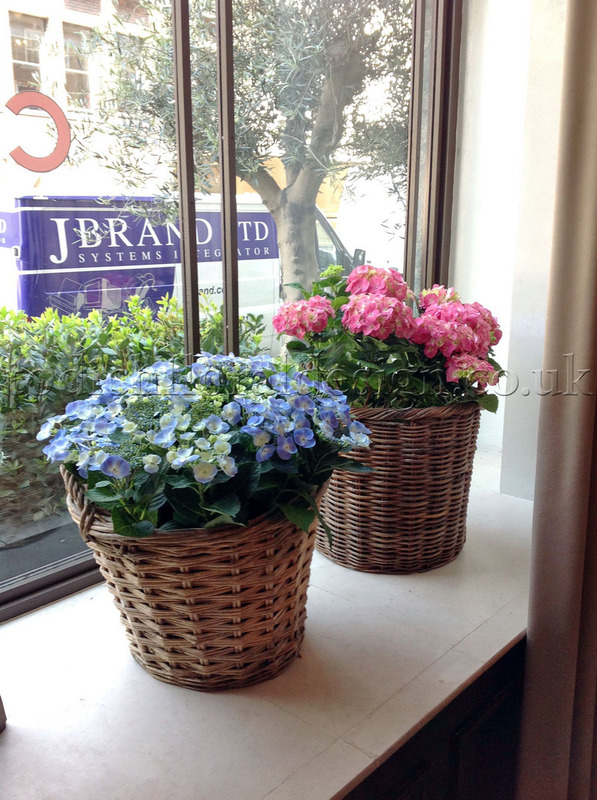 To create an impact we decided to use seasonal hydrangeas of all different colours placed in different sized baskets. We felt this would give ‘wow’ factor as soon as guests entered the restaurant. The ladder was also styled with natural looking containers filled with seasonal plants that finished off the design; we also included jasmine which hanged down from the top of the ladder. We installed the design at the beginning of June and will continue to change the theme; we will keep you updated for the next month. We are already planning July and have some amazing ideas! !